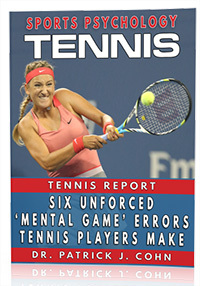 In order to play optimally in tennis matches, you must face challenges head on. How you view challenges all boils down to your mindset. Like anything, challenges are a matter of perspective. You can see challenges as opportunities to grow your tennis game and approach them with anticipation. Or you can view challenges as failures in the making and approach them with dread. Having a negative mindset towards challenges will produce half-hearted efforts and a scattered focus, likely leading to sub-par performance during matches. By having the right mindset, challenges should help you soar to new performance heights. Flexibility – You need to be able to go with the flow, to deal with unexpected circumstances and maintain your composure in critical situations. If things are not going as planned, quickly adapt and find a solution. Controlled Positive Emotion – You should have a sense of excitement when facing tough opponents or critical moments in matches. Get psyched about the fight. It is your opportunity to shine. 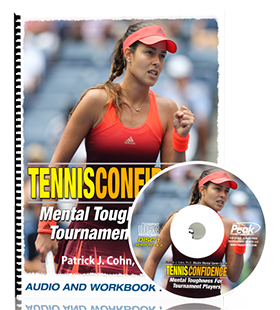 Mental Strength – You need to be able to dig in and play to your abilities despite the odds. Never give up even when the odds seem against you. Focus on giving full effort and fight hard until the last point. Never let your opponent see you sweat. Resiliency – You must be able to quickly bounce back from disappointments, mistakes and missed opportunities. Get right back in that positive mindset. Remain optimistic as you prepare for the upcoming point. Enjoyment – You should have fun competing. Tennis is a game. Games are most enjoyable when they challenge your abilities. Tip #1: Challenge yourself in practice. It is easier to have that fighting mentality in matches if you train with the same intensity in practice. Train your brain to react positively to challenging situations. Tip #2: Adopt the mentality “BRING IT ON… I can take whatever you throw at me.” Get psyched at the opportunities to overcome challenges in matches. If you want to achieve your potential in tennis, you need to welcome challenges as the vehicle to expand your game. Thanks for article. I agree that players should focus on giving full effort to concentrate on game. I think that mental force is the main advantage of Novak.